That's pretty darn cute! 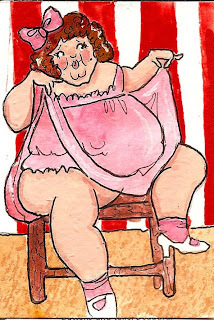 Nothing like a large circus lady dressed up like a baby doll! Great idea and she is happy in her self it seems! Love it Jo! great illo and so nicely done! I agree really cute, a great idea for the theme. This is so funny! Love the colors. Funny and sweet!I love it! She looks very sweet and dainty! Wonderful illustration! I love your coloring and line work! Great theme, too! I love a big gal with confidence! That's a lot of woman. Nice illustration. Great color choices. Perfect color choices! Liv'n large! Nice drawing and very very cute. Like the expression and pose. Well done.